Merchant services comes in many different forms. A person can have a merchant services terminal, a point of sale system, or even eCommerce abilities. Most people are familiar with the terminal in which they insert their credit card and handle the transaction on their own, and eCommerce options through internet shopping webpages. However, what exactly is a point of sale system and how does it work? When you enter a restaurant, you do not typically see a terminal attached to the cash register. Instead, you often see a computer type system in which orders are entered and there is a place to cash out a bill and swipe a credit card. This is known as a point of sale system (or POS). This system allows an employee to swipe your credit card easily and print out a receipt for your signature, without taking up too much space or needing a separate system for accepting payments. 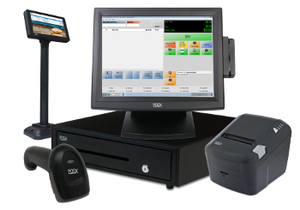 Point of sale systems are most common in the restaurant industry and some higher end retailers. Yet, they are not limited to these types of location and can be useful in almost any industry when debit cards are not an acceptable form of payment. Gone are the days when your point of sale system required it own desk or counter. Technology has come a long way and systems have gotten much smaller. Of course, a point of sale system is still going to be bigger than your basic cell phone. However, now there is the option to have a system that takes up only as much room as your iPad. As opposed to the larger computer that includes a cash register and larger computer screen, it is possible to have a system that is integrated into a specialized iPad. The company can upload any information needed to run their business, including employee schedules, specials, and product pricing. The system is easily installed to fit directly on the counter top and can even rotate as needed to allow the customer to sign directly on the screen and have their receipt emailed to them, without every using a single piece of paper. Of course, the large systems are still widely in use and have their place in the world of merchant services. A business owner can choose to have a larger computer system that includes the receipt printer, scanner, and cash register. These systems are a bit more costly and take more room, however, are great for many retailers. No matter what type of Point of Sale System you may need, Tanker Consulting Services is happy to help. We will help you find the best fit for you at the most affordable rates in the industry.